The NBA regular season is creeping closer and closer and Jimmy Butler is getting anxious. He had a thing or two to say at Minnesota Timberwolves practice on Wednesday and it left everyone speechless. Meanwhile in MLB, the League Championship Series are set and the College Football Playoff picture is starting to become clearer. There is no more trade news about Butler, but that does not mean the story was quiet this week. 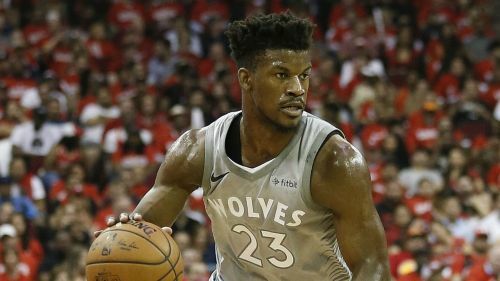 The Timberwolves star, who asked for a trade three weeks ago, showed up to practice for the first time since asking to be dealt and the results were crazy. Butler started the afternoon by taking the court with all of the Timberwolves backups and proceeded to defeat Minnesota's starters convincingly in a heated game of five on five. The former Chicago Bulls star then reportedly went on to berate team-mates Karl-Anthony Towns and Andrew Wiggins and took shots at head coach Tom Thibodeau and general manager Scott Layden, screaming at the top of his lungs, "You f****** need me!" He then promptly walked off the court to a silent gym floor. The Timberwolves play their first game against the San Antonio Spurs on October 17. The MLB League Championship Series are set as the Boston Red Sox will take on the Houston Astros in the American League and the Los Angeles Dodgers will face the Milwaukee Brewers in the National League. The matchup between the Astros and Red Sox will be the first between two 100-win teams since 1977 and will feature the defending World Series champions in Houston. They will try to repeat as AL champs and then hope to become the first team to repeat as world champs since the 1998-2000 New York Yankees. In the NL, the Dodgers will be looking to get back to the World Series for the second year in a row and the Brewers will attempt to get back for the first time since 1982. Los Angeles have not won a world title since 1988. The Brewers have never won. LeBron James signed a four-year, $153.3million deal with the Lakers this offseason and fans in Las Vegas, NV were treated to the first of two preseason matchups between the James Lakers and Golden State Warriors this week. The Lakers took game one behind 15 points, 10 rebounds and five assists from James while Kevin Durant fouled out in the third quarter for Golden State. Los Angeles and Golden State will face off once more this week and then four times during the regular season. There is nothing at all set in the College Football Playoff this season, but the good thing about the current setup of the postseason is teams effectively are eliminated before they even get to the final round of four. This past weekend there were several teams who both strengthened their case for inclusion in the tournament and others whose cases got weaker. Number seven Oklahoma fell to Texas 45-42 in the Red River Rivalry which puts Texas in the conversation for a spot. Auburn were all but eliminated with their loss three weeks ago to LSU, but by losing to Mississippi State last week they were truly knocked out. That makes Washington's resume look even worse now as they fell to the Tigers in their season opener. Then there is Notre Dame which dropped number 23 Virginia Tech, giving them three wins over ranked opponents this season. The Fighting Irish are now firmly in the conversation for a spot in the playoff. Nothing is decided yet, but several teams are moving in college football. Lost in the chaos that was the Conor McGregor, Khabib Nurmagomedov melee at the end of UFC 229 was the fact that Derrick Lewis' comeback win put him firmly in the conversation for a title shot in the heavyweight division. He is no longer just in the conversation though as it was announced Lewis will face off with Daniel Cormier for the heavyweight belt at UFC 230 on November 3. Lewis' comeback win over Alexander Volkov was one of the most exciting on the night at UFC 229, but Cormier is a different type of fighter as he remains undefeated as a heavyweight in mixed martial arts. Lewis has now won three straight fights and will likely be the last man to take on Cormier before the UFC's light-heavyweight and heavyweight champion hopes to take on former winner and current WWE wrestler Brock Lesnar in a potential super-fight. Cormier has not set up a rematch with Jon 'Bones' Jones, who is the only man to have defeated him in the octagon at light-heavyweight. Jones just returned from a lengthy suspension and is signed on to take on Alexander Gustafsson in a rematch of the one of the greatest light-heavyweight matches for the belt in UFC history.